Our species is incredibly social, and one of the major products of our sociality is culture. People typically imagine culture to be exclusive to humans. The idea of culture brings to mind examples that are uniquely human phenomena: blockbuster movies like The Fast and the Furious franchise, great arthouse crime films like Drive, the art exhibited at the Louvre in Paris, or sharing a traditional meal with one’s family. These phenomena are perfectly valid associations with the idea of culture, but it may come as a surprise that culture is not exclusive to our species. Dr. Andrew Whiten, a professor at the University of St. Andrews and an expert on non­human cultures (yes, non-­human! 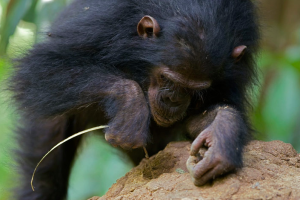 ), has done extensive work on chimpanzee culture. Chimpanzee culture! But we don’t see chimpanzees publishing novels or displaying art in galleries. This observation is likely correct; however, one must consider the definition of culture. Whiten defines culture as “all we learn from others that endures for long enough to create socially transmitted traditions” (Whiten, Vince, & Mace, 2014). With this definition, cultural behavior is well established in species other than humans: dialects in song­-birds, sweet-­potato washing and stone-­handling by Japanese Macaques, and tool use and various other social behaviors in African chimpanzees (Whiten et. al., 1999). By the way, you can hear about some of Whiten’s work on chimpanzee culture in a presentation here. Culture is a deeply intriguing social phenomenon. How and why does cultural behavior emerge from evolutionary processes, and what advantages does cultural behavior bestow upon its practitioners? The journey to understanding the evolution of cultural behavior meanders through the evolution of sociality. Basic forms of social interactions form the building blocks for cultural behavior. Without sociality, individuals lack the capacity to socially transmit information among one another, and without the capacity to socially transmit information, cultural behavior cannot exist. So, what exactly does it mean to be social? What other forms of social behaviors are found in nature? And, why might social behavior evolve in the first place? For the purpose of this discussion, we are going to consider sociality as a tactic employed by an individual or group of individuals that increases the fitness of group members (Armitage, 1999). Evolution has produced many examples of sociality in organisms; aside from cultural behavior, this blog post will give an overview of two: social grouping and parental investment. 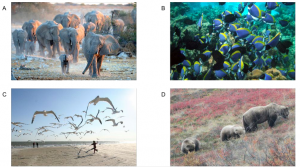 Social grouping can be seen in herds of African elephants, schools of surgeonfish, or flocks of seagulls. Parental investment is defined as “any investment by the parent in an individual offspring that increases the offspring’s chance of surviving (and hence reproductive success) at the cost of the parent’s ability to invest in other offspring” (Campbell, 1972). Parental investment can be seen in mother grizzly bears taking care of their cubs. Rather than abandoning her offspring at birth in favor of having more offspring, the mother grizzly takes care of her cubs until they reach sufficient maturity to take care of themselves. All of these examples are great, but if we think back to natural selection, an individual’s fitness is a function of their ability to reproduce relative to their competitors. If one individual is acting socially to increase the reproductive success of other group members, doesn’t sociality decrease an individual’s fitness relative to other group members, and shouldn’t natural selection oppose social behavior? At a glance, this seems like a reasonable hypothesis; however, with a closer look, one can see the evolutionary benefits of organismal sociality. Social grouping can decrease an individual’s susceptibility to predation through increased vigilance (example: shared responsibility for watching for predators in herds), aggressive group defense behavior, increased ability to find and obtain food sources, or just through the fact that larger groups lower an individual member’s probability of being preyed upon (Swedell, 2012; Alexander, 1974). Parental investment is a deeply interesting area of research, and is much more complicated in actuality than what I will mention here (see the parental investment section of Alexander 1974 for a nice introductory overview). Kin selection offers an insightful view into some of the advantages of parental investment. Kin selection is “the evolution of characteristics which favour the survival of close relatives” (Smith, 1964), which is potentially at the cost of the individual. In other words, if an individual’s close relatives are reproductively successful with the aid of the individual – even at the cost of the individual – the individual’s genes are likely to persist into the next generation because the individual and their close relatives are likely to share many genes. In the context of parental investment, parents may invest heavily in their offspring in order to increase the possibility of grand-­offspring. We can clearly see how social behaviors like social grouping and parental investment facilitate cultural behaviors by looking to our own species. The social transmission of traditions from parent to offspring and from individual to social group is widespread in human societies; this transmission can be thought of as an instance of parental investment. We also often share socially acquired knowledge and traditions with other people in our local communities (e.g. your grandmother’s famous recipe for gumbo); these communities act as our social groups and provide a forum to socially transmit information to others. Social grouping and parental investment might be potential building blocks for the evolution of cultural behavior, but what possible selective advantages are conferred to practitioners of cultural behavior? If we consider culture and organisms’ genomes as information storage mechanisms, culture provides an alternative method of encoding and passing information among individuals in a population as compared to gene propagation through reproduction. As an information storage mechanism, culture is much more fluid and quick to change than information stored at the gene level (there is no need to wait around for mutation and natural selection to act); however, this is at the cost of being more fragile (traditions must be taught to offspring, there is no way to pass them down genetically). Insights into the evolution of sociality may lead to a deeper understanding of evolutionary history because many species behave socially. Our own species is incredibly social; you can imagine how the human species displays all of the examples I’ve talked about here (cultural behavior, parental investment, social grouping). Progress in our understanding of the evolution of sociality may offer us an even deeper understanding of our own species. Alexander, R. D. (1974). The evolution of social behavior. Annual review of ecology and systematics, 325­383. Armitage, K. B. (1999). Evolution of sociality in marmots. Journal of Mammalogy, 80(1), 1­10. Campbell, B. G. (Ed.). (1972). Sexual selection and the descent of man, 1871­1971. Heinemann. Smith, J. M. (1964). Group selection and kin selection. Nature, 201, 1145­1147. Swedell, L. (2012). Primate sociality and social systems. Nature Education Knowledge, 3(10), 84. Whiten, A., Goodall, J., McGrew, W. C., Nishida, T., Reynolds, V., Sugiyama, Y., … & Boesch, C. (1999). Cultures in Chimpanzees. Nature, 399(6737), 682­685.